You wouldn't know it by using the Finder, but your Mac has thousands of hidden files that can't be found or accessed using conventional methods, like opening a folder or searching with Spotlight. Most of these secret files are hidden from view to protect the innocent. Apple doesn't want new users poking around in the /sbin directory, because there's no real reason why they would need to access it. But advanced users may want to see all of the files on their Mac, for whatever reason. Enter the following command to force the Finder to show hidden files. Open a Finder window. The hidden files and directories are displayed with dimmed icons, as shown below. Use caution when accessing hidden files and folders. 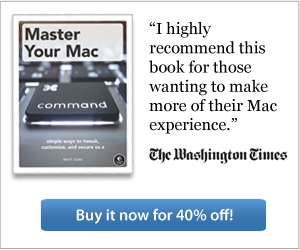 There's a reason why Apple decided to hide these items in Mac OS X. In a worse case scenario, you could accidentally edit and damage a critical file needed by an application or the operating system itself, which would necessitate a reinstall. 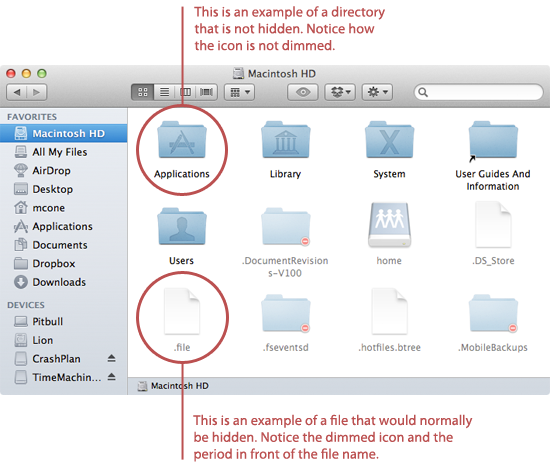 What Type of Files are Hidden in Mac OS X? Now that you've revealed a ton of files on your Mac, you might be wondering what they are and what they do. Take a look at this comprehensive article for some of the most common types of hidden files and folders you'll see. Remember, if you don't know exactly what a hidden file or folder does, you should probably leave it alone! If you previously enabled the hack to show hidden files on your Mac, and you've decided that you no longer want to see hidden files in the Finder, you can disable the feature. You've disabled the feature. Hidden files will no longer be displayed in the Finder.